Just presented 20 Actionable Techniques to Enhance Your Blog’s Content at the Blogging Success Summit, an amazing series of virtual presentations put on by Social Media Examiner. During the presentation, I shared these 10 blogging tips for beginners and experts alike that I believe are imperative for all content marketers Here they are. Your blog title is like the cover of a magazine. There is one purpose for a magazine cover…to get you to open the magazine. The same holds true for a blog post. The greatest blog post in the world might not be read unless you have a compelling title. In an analysis of my top content marketing posts for 2010, we found that the most popular/most effective posts had some kind of number in it (i.e., 10 Most Popular Posts for 2010). Even better was putting two numbers. Controversial is also good. This is where you always should start. What are the pain points of your target reader? What keeps them up at night? Here’s a great example by Jay Baer where he starts the post by focusing on the problem…in this case, that customer service is a nightmare today because of social media (or can be). If your blog focuses 100% of the time on what keeps your customers and prospects up at night, you will most likely be successful. Blogs are best when they are shorter, instructive and to the point. Only on a rare occasion is there a need to ramble on about an issue. One of my most popular posts, A blog is like a miniskirt, was only 23 words. If your blog draft ends with 500 words, try to edit it down to 350. That cuts out the clutter. Join us on Twitter, Facebook, LinkedIn, YouTube, etc. Remember, 80% of your blog traffic will probably never come back. Show your readers additional, relevant content offers, like a valuable, niche enewsletter so you can continue to communicate with them. Getting opt-in email names should be one of your top blogging goals (grow the database). 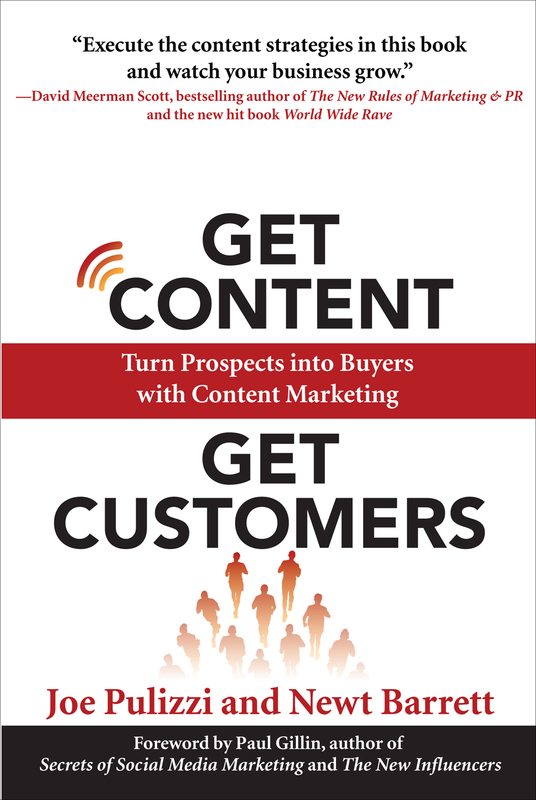 Get Content Get Customers started as a series of blog posts. The Content Marketing Playbook began as a series of blog posts. Continually think about how you can take blog posts and repackage into something more substantial. Planning for this ahead of time makes all the difference. One blogging idea could be 10 pieces of content. Think about that for a second. Target the top 15 blogs in your industry and offer to do relevant guest posts on their blogs. Never turn down an opportunity for a guest post. I’ve done guest blogs for more than 100 blogs and it has been one of the most important keys to building our social media and search engine presence. Everyone loves lists, especially the people on the list. The Junta42 Top 42 Content Marketing blogs, now in its 10th installment, rates the top bloggers and influencers in the industry. More than half of the top 42 place our widget (with the link) on their site. Talk about SEO and branding love! Do a press release about the list. Here are 21 blog metrics that you can measure as part of your blog. Choose the ones that make the most sense with your overall content marketing and blogging goals. Make sure you and your team know what the goal of the blog is and that everyone sees the statistics. Track lead conversions, and what type of content led to the conversions. 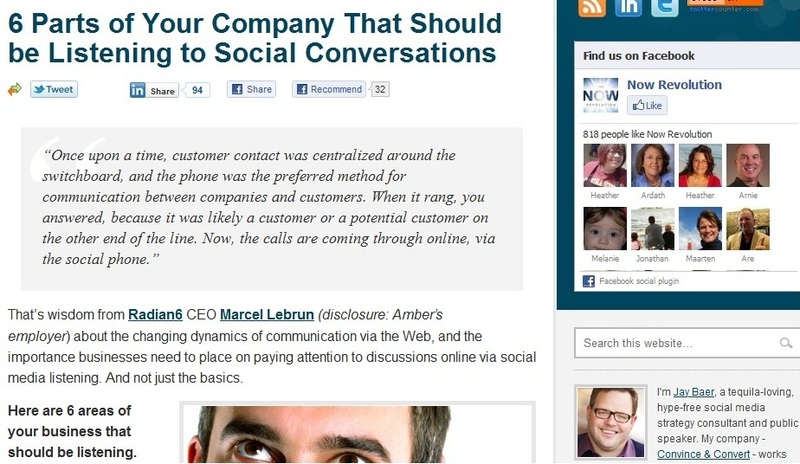 Track the most read, most engaged in content and do more of that. Track the referral sources that perform the best. Find more of those types of referral sources. Most industry heavy hitters will do a podcast interview or Q&A if you ask. They will probably also share it with their network when it’s finished. Here’s an example of a Q&A with David Meerman Scott. Most businesses outsource a portion of their content marketing. Find a great writer to help you. Find a content agency or content team to take your blogging/strategy to the next level. Some companies have a difficult time telling engaging stories. Enlist help. It’s available. Be sure you are blogging on a niche topic where you can be the leading expert in the world. If not, you may be targeting too wide a topic. Then do the 10 blogging tips above.